5/27/2015Postdoc Live! Featuring Matthew Hufford, Ph.D. The seventh annual meeting of the Indiana Clinical and Translational Sciences Institute and awarding of the second Watanabe Prize in Translational Research will be Friday, Sept. 11, at IUPUI’s Hine Hall. This year’s winner of the Watanabe Prize and the meeting’s keynote speaker will be Carl H. June, M.D., Richard W. Vague Professor in Immunotherapy and director of the Center for Cellular Immunotherapies in the Perelman School of Medicine at the University of Pennsylvania. The Watanabe Prize in Translational Research presented by the Indiana CTSI and the IU School of Medicine recognizes a member of the scientific or medical community who has achieved outstanding accomplishments in translational research. As the recipient, Dr. June will spend several days in Indiana to share his knowledge with audiences at IUSM and partner institutions. The Indiana CTSI annual meeting also will highlight two outstanding young investigators named Watanabe Translational Scholars. They will present a brief overview of their research during the event and will be mentored by Dr. June over the next two years. For more information, contact Indiana CTSI at info@indianactsi.org. Kim Sherbrooke, chief operating officer, IU Health Physicians, is leaving the organization to assume the role of chief operating officer of Office of Johns Hopkins Physicians. Sherbrooke began serving as IU Health Physicians COO when the physician group was formed in 2009. During her tenure, she was responsible for practice operations in more than 150 ambulatory locations, physician services in 11 hospitals and a service contract at a partner safety-net hospital. Sherbrooke’s last day with IU Health Physicians is June 16. A farewell reception is scheduled from 3 to 5 p.m. Friday, June 12, in the Fairbanks Hall lobby. IU Health Physicians will pursue a national search to fill the COO position. The IU School of Medicine’s pediatrics unit has a new safety "hero." Dressed in a red shirt emblazoned with a golden capital "S," Safety Scout -- a blue raccoon -- is the newly commissioned mascot for the Division of Safety Education and Outreach, part of the IUSM Department of Pediatrics. Scout is the creation of Herron School of Art and Design junior Trisha Mason, one of 10 illustration and drawing students who presented preliminary concepts. Safety Education and Outreach Director Susan Stanley said her division has wanted a mascot for a number of years. She turned to Herron for help after designs submitted from professional illustrators didn't capture the essence needed. "We were so impressed when they presented," Stanley said. "They are a very talented group and they made it an incredibly difficult choice. The potential mascots included cats, dogs, squirrels, rabbits, skunks and birds. Each rendering had its unique charms. We selected our top four choices and then had kids and adults tell us which one they liked best." The mascot character needed to be gender neutral, expressive, cute and cuddly. It needed a wardrobe, too, including de rigueur items like a bike helmet and life jacket. It also needed to appeal to parents, but especially to children in a broad age range because accidents are the leading cause of death in children ages one to 14. IU School of Medicine Graduate Medical Education seeks a program director for the Transitional Year Residency Training Program, which is accredited by the Accreditation Council for Graduate Medical Education. The program director will oversee residency training, work closely with the associate dean for graduate medical education and serve on the IUSM Graduate Medical Education Committee. More information about the program director position, including responsibilities and qualifications, is available. The position is part time and will become effective July 2015. Letters of interest and CVs should be sent to Linda Bratcher, director of graduate medical education, at Fesler Hall 318 or lbratche@iu.edu. Application deadline is June 4. "Strategies for Managing Your Workplace Effort" will be the topic of the next Faculty Enrichment and Education Development workshop at 5:15 p.m. Tuesday, June 2, in the Eskenazi Hall Rapp Conference Room. Dr. R. Kevin Grigsby, senior director of Member Organizational Development at the Association of American Medical Colleges, will be the featured speaker. From 2000-09, Dr. Grigsby served as vice dean for faculty and administrative affairs and professor in the Department of Psychiatry at Penn State College of Medicine in Hershey, Pennsylvania. His experience includes a history of program planning, implementation and evaluation in the area of innovative home- and community-based health and mental health services. Register for the June 2 FEED workshop. The event is sponsored by the IUSM Office of Faculty Affairs and Professional Development. For questions, contact the office at 317-278-3089 or ofapd@iupui.edu. Nominations are sought for the Mechthild Esser Nemmers Prize in Medical Science, awarded to researchers whose bodies of work exhibit outstanding achievement in medical science as demonstrated by works of lasting significance. This biennial prize of $200,000 is one of the four Nemmers Prizes administered by Northwestern University. Nominating letters of no more than 750 words should describe the nominee’s professional experience, accomplishments and qualifications for the award. Self-nominations will not be accepted. More information about the Nemmers award and full nomination guidelines are available. Submission deadline is Sept. 15. The fifth International Breast Cancer Prevention Symposium, "Epigenome, Environment & Prevention Tools," will be Oct. 2 and 3 in Le Gosier, Guadeloupe, French West Indies. The symposium's goal to bring together global public health actors, advocates, clinicians and researchers on breast cancer prevention to discuss the impact environmental factors such as foods, stress, pollutants and exercise have on the genome. Attendees will explore the impact of new knowledge in the genome on prevention interventions and the need for biomarkers, health and food policy and practices, and socioeconomic and cultural contexts in which environmental factors come into play. The event is sponsored by International Breast Cancer & Nutrition, Oncological Sciences Center, Purdue Discovery Park, Purdue University Center for Cancer Research, Purdue University Department of Nutrition Science and the National Institute for Prevention and Health Education at the French School of Public Health. Deadline for submitting abstracts for presentations is June 30. Register for the symposium. Contact Kris Swank at kswank@purdue.edu with questions. Oscar W. Cummings, M.D., has been named the Lawrence M. Roth Professor of Pathology. He will retain his current title of professor of pathology and laboratory medicine. The first holder of the Roth professorship was Thomas M. Ulbright, M.D., who retired at the end of 2013. The appointment was effective May 1. 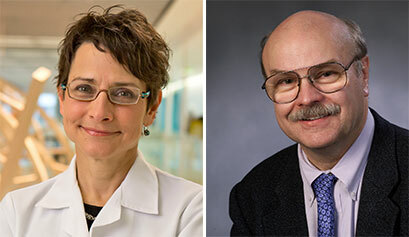 IU Center for Aging Research and Regenstrief Institute investigators Michael LaMantia, M.D., MPH, and Kathleen Unroe, M.D., MHA, were honored last week by the American Geriatrics Society at its annual scientific meeting. Dr. Unroe was named an American Geriatrics Society fellow, a status bestowed on American Geriatrics Society members who have demonstrated a professional commitment to geriatrics, contributed to the progress of geriatrics care, and are active participants in the society's activities. Dr. LaMantia received an American Geriatrics Society New Investigator Award, one of only five to be presented by the national organization this year. This award honors individuals whose original research reflects new insights in geriatrics and a commitment to academics in aging. Lisa Mayer, B.S.N., R.N., associate director of the IU School of Medicine neonatal resuscitation program, was named Nurse Educator of the Year in the annual Salute to Nurses Awards program presented by the Indianapolis Star. 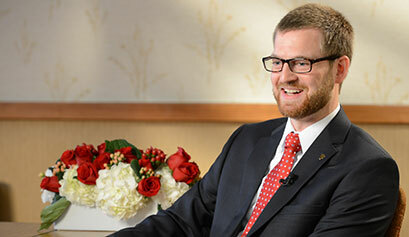 A nurse for 18 years and a nurse educator for IU Health Physicians, Mayer teaches multidisciplinary providers about caring for some of the youngest patients in Indiana.